Signed lower left, Leonard Ochtman. Oil on board. 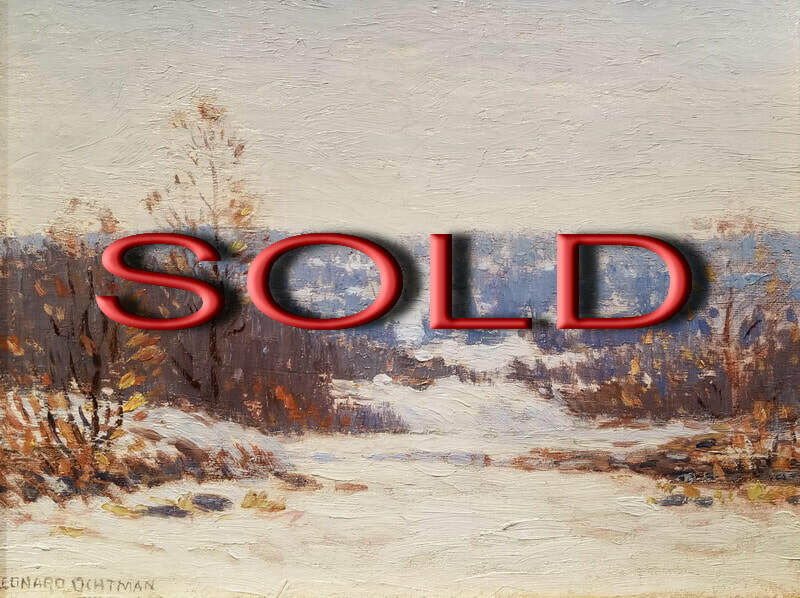 8" x 10"
Born in Zonnemain, Holland, Leonard Ochtman became a noted Tonalist and Impressionist landscape painter of sunsets, twilight and dawn scenes that conveyed silence and serenity. His work was highly sought after in the early part of the 20th century when he did many award-winning oils and watercolors. Ochtman came to America in 1866 and settled with his parents in Albany, New York. He became an apprentice in engraving, but as a painter was almost entirely self-taught. He drew and painted from nature and from what he saw in galleries. In 1887, he returned to New York City where he opened a studio with Charles Warren Eaton. Shortly after, he married Nina Fonda, a student, and they settled in Cos Cob, Connecticut on the Mianus River whose changing scenery was often the subject of his landscapes. He and other painters such as J. Alden Weir, Childe Hassam and John Henry Twachtman founded what became known as the Cos Cob Colony, a center of Impressionist painting. In the 1890s and early 1900s, Ochtman was at the height of his career, and was described as the "Keats of landscape" for his poetic studio landscapes, especially winter scenes bathed in light of dawn or dusk. He once told his daughter that he could paint snowscenes out of his head in the summer time. In the period of his high success, he sold many paintings, and earned national awards, and patronage from prominent collectors.